“Never believe anything until it is officially denied.” (John Pilger). Well the US has officially denied that events in the Ukraine amount to a battle between East and West. And as we all know, it is exactly that. Should the Ukraine be allied with Russia or the EU? The country is divided over the issue, and there is a sizeable ethnic Russian population that wants to stay with Russia. The outcome is not yet clear. Astrologically, it is the latest in a series of Uranus-Pluto crises that have been afflicting the world. 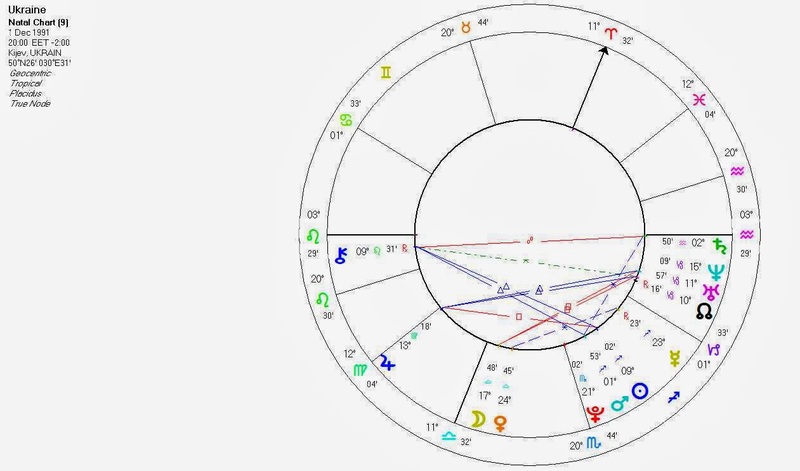 The 2 planets are moving towards another exact square (in April, the 5th of 7) and the Ukrainian crisis has peaked, which often seems to be the way of it with these Uranus-Pluto transits: a month or two before the exact aspect happens, all hell breaks loose. And the reason the world has its eyes on the country is precisely because it embodies the struggle between East and West, the remains of the Cold War, as Russia – like the UK before it – gradually loses influence to a level proportionate to its population and economic strength. But that is also why the US is saying that there is no battle, because in a sense there is none, Russia has already lost. 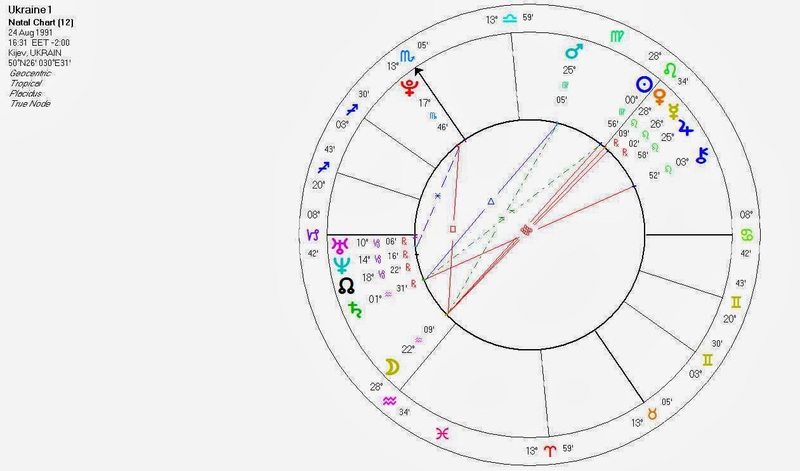 The Cold War officially ended in the second half of 1990, with Uranus and Neptune between 7 and 13 Capricorn (their conjunction was the main significator of those events), but the fact that Pluto is now transiting these points suggest that we are indeed seeing a revisitation of those times, maybe a clearing up of unfinished business. Under Uranus-Pluto, underlying weaknesses or tensions that may have been brewing for years come to the surface and are fought out. Pluto, Lord of the Underworld, reveals the issues that have been cooking beneath the surface. Uranus the sky god facilitates their eruption and brings polarisation, radicalism and new solutions. Under the current transit, the structures of power (Pluto in Capricorn) are challenged by the fresh vision, the new beginnings of Uranus in Aries. Politically, it’s not usually very pleasant. Sometimes, where there is great potential within the current forms, Uranus-Pluto can represent not a dissolution but an empowerment, dramatic growth, as we have seen with China. I don’t think you need to see the chart of Ukraine to be pretty certain that Uranus-Pluto is transiting it in a major way. It’s one of those times where you think if this isn’t what is happening, then astrology doesn’t work! Unlike the chart for an individual, the chart for a country is rarely a simple matter. At what moment was the country ‘born’? 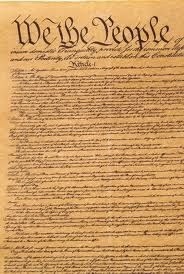 And which incarnation, which new constitution or newly regained independence shall we use? The Ukraine never seems to have had much in the way of a continuous independent existence, so the charts dating back to the break-up of the USSR seem as good as any. And for that event, in Nick Campion’s Book of World Horoscopes, we find 2 charts. One for Ukraine’s declaration of independence on 24 Aug 1991, and one for a referendum confirming independence on 1 Dec 1991, at which point, we are told, with foreign recognition in place, it began to function ‘as a genuinely independent sovereign state’. The first seems more of a legal, governmental decision/aspiration, the latter one that included all aspects of the newly-born state, and crucially the people. If we use the USA as a precedent, then we find 2 parallel charts (as well as others). There was the Declaration of Independence on 4 July 1776, but 2 days before that Congress had already voted and agreed on the matter, so which day, let alone time, do we go with? 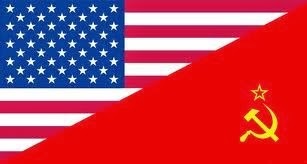 Popular practice has gone with the 4th of July, when both legal and popular agreement had been addressed (though not decided on in a referendum). Maybe it depends what aspect of the country you are looking at, but I’m inclined to go with the final chart for a reading of the general state of the country, when legal and popular issues have been addressed, and foreign recognition is in place. I don’t know the national character of the Ukrainians, so I don’t know which chart describes them best, but one thing we do know is that they are a divided people, and both charts clearly express this: in the first chart, we see Uranus Rising, and in the second chart we see Uranus conjunct the North Node and square the MC. Uranus is at 10 Cap in both cases, and so currently subject to the Uranus-Pluto square. With the division within the country so stark and so ethnic, a split is possible. It is difficult enough as an individual to feel at ease with yourself and society if you have a prominent Uranus, let alone if you are a large collective. The UK (1801) has Uranus Rising square to the Sun, and I think that gives rise to contradictions within the country – such as the democratic impulse (Uranus) vs the strong class system and love of tradition and royalty (Sun in Capricorn) – and maybe that has a creative aspect, which is Uranus at its best. But it also suggests instability, and whether or not Scotland votes to become independent this year, devolution or even separation of parts of the UK has always been an issue, with Eire (gone), Northern Ireland (bound to go eventually), Wales and Scotland. 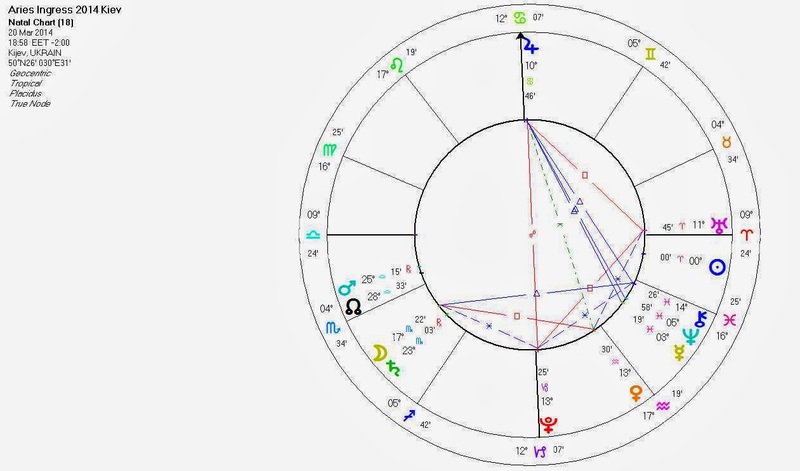 It doesn’t get much stronger than this, and maybe therefore the earlier birth chart is the one to go with for now, despite what I said earlier, until a possible re-birth of the country. Angular Neptune and Pluto, Uranus square the Asc, showing the powerful forces of struggle, protest and dissolution that both the government (Angular Sun opp Neptune) and people (Moon conj Uranus and square Pluto) are going through. It’s quite a remarkable chart. 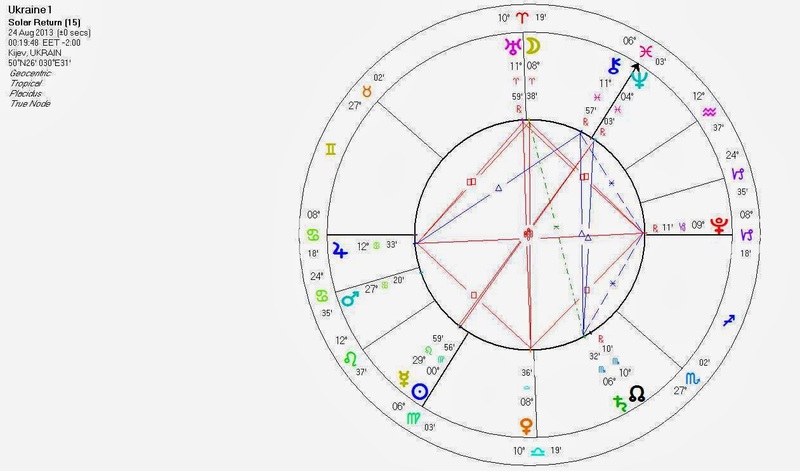 Regardless of which is the best chart to use, the Aries Ingress chart for 2014 (in 3 weeks time) set for Kiev has Uranus, Pluto and Jupiter on the Angles. The October Libra Ingress (after which the current troubles began) had Neptune and Pluto on the Angles. So the revolution and unrest look set to continue for some time yet. Uranus in the upcoming Aries chart points to the issue of the country perhaps splitting. 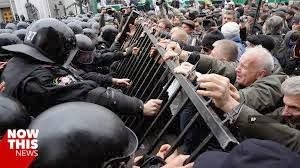 The Ukraine is just one country having a crisis, but it is critical geo-politically, and so describes bigger themes within the Uranus-Pluto transit that the world is going through. essentially unresolved; meanwhile the greatest economic expansion the world has ever seen, the modern rise of China, has continued apace and is gradually shifting the balance of world power. 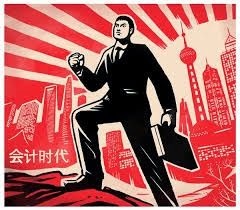 That said, China has itself built up huge internal debts as it attempted to tackle the world economic slowdown through government spending, and it may yet have its own crisis as Uranus-Pluto continues to run its course. Meanwhile the US political crisis, a struggle that has been going on since the end of the Cold War, in which the right wing of the Republican party seems prepared to bring the country to its knees rather than let the Democrats govern, has ways to go, particularly as Pluto makes its exact oppositions to the US Sun this year and next. Uranus and Pluto still have 3 exact crossings to make between now and March next year, and they will remain within orb for some time after that. The new shape of the world has yet to become clear, a shape that will remain until the next time 2 outer planets make a hard aspect, which will be Uranus square to Neptune in about 25 years’ time. As always, I learn so much from reading your blog. Thanks again! Thank you for your very rational and thoughtful observations.